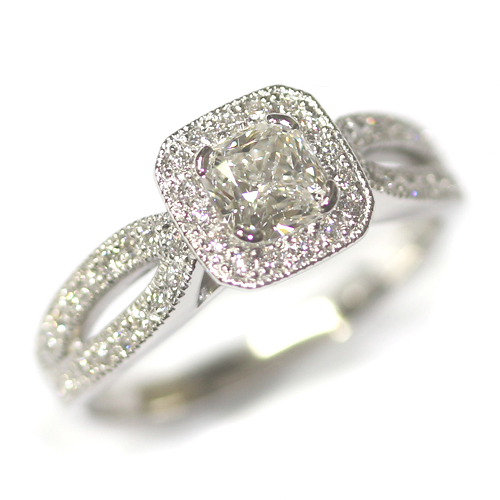 A stunning platinum halo engagement ring with an asscher cut diamond centre stone. 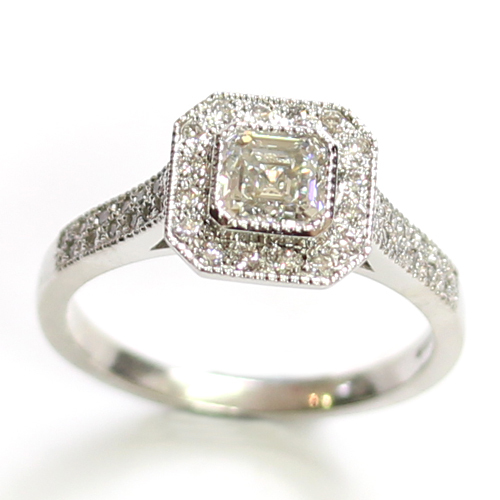 The customer came to us for a bespoke engagement ring that boasted a beautiful 0.70ct asscher cut diamond. 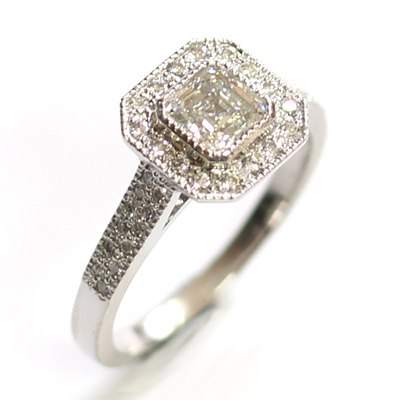 Following in the style of one of our previous creations, a Palladium Tiffany Inspired Victorian Style Engagement Ring, they were looking to have an octagonal halo around the centre diamond. A millgrain detail separates the centre asscher cut diamond and the 16 round brilliant cut grain set diamonds of the halo. This intricate detail then carries on down the shoulders to frame a further selection of round brilliant cut diamonds of matching colour and clarity. A bold and elegant antique style engagement ring with lots of sparkle! 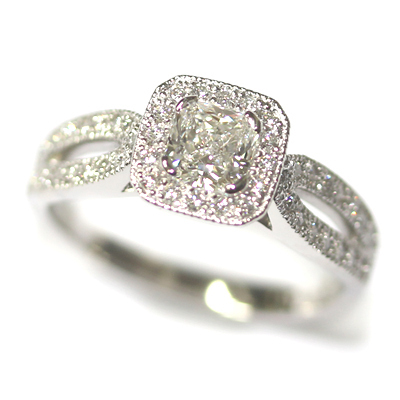 A sparkling diamond halo engagement ring with split diamond set shoulders. Bold and beautiful, a cushion cut diamond sits at the centre of this bespoke engagement ring design. 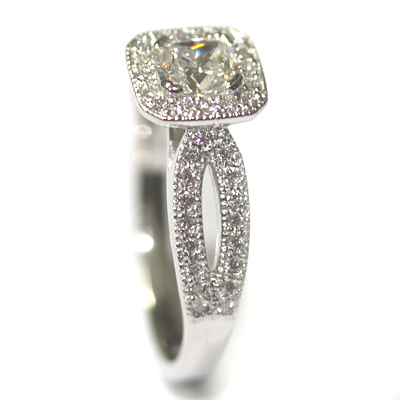 Petite, round brilliant cut diamonds then frame the centre stone in a beautiful, sparking halo. To ensure a flawless finish, all the diamonds are of matching colour and clarity. The shoulders of the ring are split to create a pretty, undulating profile too. 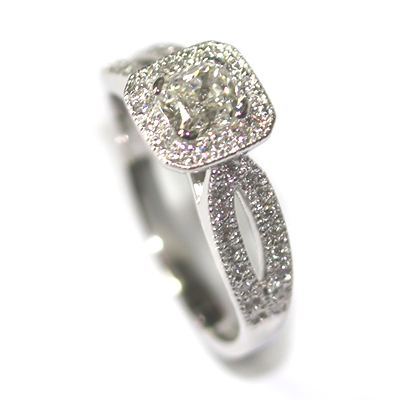 They are also diamond set, by hand, for that extra sparkle! The customer chose for their bespoke engagement ring to be cast in platinum. A great choice for such a sparkling piece. Stunning! They then returned to us for their bespoke Wedding Ring with Milgrain Detail.